It is a timeless fact that your mid-twenties can be a daunting place. Richard Linklater’s Boyhoodhas won plaudits this year by only taking the young man to his late teens – Eric Rohmer, an inspiration to Linklater, is more interested in the summer of a single woman in her mid-twenties. Both filmmakers’ know how to capture a moment and freely utilise the flexibility of acting and truth to adapt and develop their art. 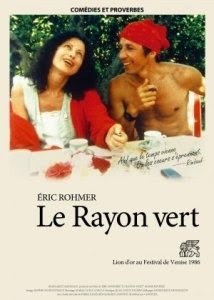 Rohmer, in The Green Ray, even credits his lead actress Marie Rivière as co-script-writer to prove her crucial involvement. The Green Rayis deeply personal, capturing the brutal honesty of loneliness with an optimistic attitude towards finding your fated one. The opening of The Green Ray reveals Delphine (Rivière) picking up a phone call from a friend. Due to start her holiday, she unexpectedly has her plans change as the friend cancels. Torn between what to do, she tastes a little bit of the summer by visiting friends and family. She enjoys meals and wanders the beautiful hills of the French Alps. She ventures to rural beaches and contemplates the future and sunbathes on the tourist resorts, considering whether to hunt a man as she reflects on what she has to offer. Sequences are dated, as a visual diary, as Rohmer manages to capture her stolen glances and considered thoughts. There is truth in Rivière’s eyes as a moment resting on a wooden gate manages to reduce her to tears. In fact, we see many moments whereby Delphine cries. Her despair at the situation she’s in is only amplified by her self-chosen isolation. She wants sun, so refuses to go to Ireland. She doesn’t eat meat or sail and therefore cannot partake in many meals and jaunts into the sea. Only the momentary glance at a gentleman in a train station changes her fate – as they await the green ray on the horizon in St. Jean de Luz. The title is taken from a Jules Verne novel from 1882, whereby “heroes” search for the green ray in the sunset of Scotland. The locations Delphine visits manage to conjure up a sense of romance, warmth and happiness – a stark contrast to the lonesome, sadness we see in her eyes. There is a soothing familiarity in her tenderness. When she opens up to her friends, you can feel her frustration. Her stubborn self-confidence in her decisions can’t mask her human frailty and a desire to be with someone. Can she be with previous lover, Jean-Pierre, again? She explains how she has been in love three times and had a fiancé, but this does not give her courage. The mystical green-ray is the only sign she needs. Akin to the tarot cards she finds and the green clothes worn by characters. Auspicious moments such as these are what move her forward, not bullish man-hunting that can be found in her new friend in Biarritz. This reality is what draws us to The Green Ray. And what draws us to Francois Truffaut. And to Richard Linklater. Like Jesse and Cèline in Before Sunset, the emotional connection is one we all feel. Delphine’s truth is what deepens our respect for filmmaker Eric Rohmer, who has the confidence to simply observe those personal moments. None of the pretentiousness of Woody Allen’s upper-class or Richard Curtis’ smart-alec characterisations. The respect we hold is one of honesty. It’s the reason why Rohmer, and the French New Wave, is so important. Life isn’t glossy and Hollywood. It is the longest take and it never cuts away. That’s what Rohmer tries to do – and that’s what makes it a glorious experience to view on the cinema screen.